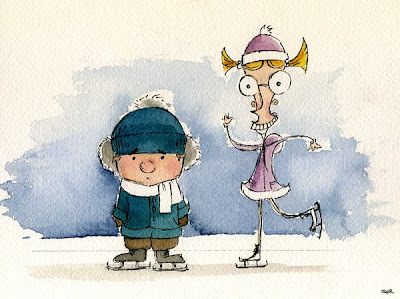 Sam Ricks: Of Giraffes and Skates . . . Here's a character from an illustration I'm working on. The finished illustration will be done shortly. While I was working on the giraffe, I just started messing around and created these two characters. There's a story here, I know it! That girl has the greatest face!! I love it. I'm glad you're using your free time to just have fun with your art, rather than just doing what teachers and employers want you to do. It must be refreshing to just goof off! 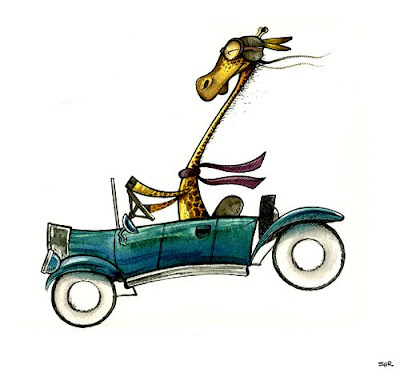 I really like the giraffe in the car. I also like the little boy in the other illustration. I like his little pink nose and cheeks; very cute. Dude, so good. You've been busy since I was last here. I'm at the very beginning of my illustrating career and am looking to grow a network of illustrators I dig to chat with and stuff. You in? For just 'messing around' the bottom drawing is adorable. I can dream up this crazy huge story about a boy and his odd sister. I hope you do a little more with these characters. Sounds like a plan, Craig. So much fun. I love that giraffe. He looks like he takes life much too seriously. I'm pretty sure most giraffes suffer the same ailment.